Eating a one dish meal like a bowl of khichdi or pulao is sometimes quite pleasing for a mom-to-be. It’s easy to prepare as it is mostly pressure cooked. In this section we have specially crafted recipes which feature an appetizing mixture of rice with lentils, sprouts or loads of veggies to make it more nutritious. On the other hand, you will also find options which substitutes the white rice with high fiber brown rice. To go healthy further, you can completely avoid the rice to make khichdi or pulao and use other healthy options like whole bajra, barley etc. to make these delicacies. Try them once and you will want to keep repeating these masterpiece regularly in your kitchen. Serve these with a bowl of Curd or Raitato complete your meal and add some protein and calcium to your diet too!! Masoor Dal and Vegetable Khichdi gives you the required iron boost during your pregnancy days. Made of a wholesome combination of dal, brown rice and vegetables cooked with aromatic spices, this traditional khichdi is rich in fibre and gives several other nutrients like b-complex vitamins, magnesium, phosphorus and zinc. Inspired by heart-warming Rajasthani Cuisine, Gehun ki Bikaneri Khichdi is a whole wheat khichdi that is sumptuous and tasty enough to make a complete meal. Replacing rice with whole wheat enhances the fibre and iron content of this recipe. Ever thought of making a khichdi with barley? Barley Khichdi exotic combination of veggies gives it a nice juicy crunch and adds to it nutrition quotient by serving as a source of thiamine, folic acid and phosphorus. Add paneer to your pulao’s to make them rich in protein and calcium. Here is a delicious Bulgur Wheat and Paneer Pulao made with broken wheat and paneer perked up with other veggies and simple spices. This recipe is not only rich in protein and calcium but also phosphorus, making it a perfect one to build strong bones. Combining cereals with dals and legumes also makes it good quality recipe. Palak Chana Pulao is the perfect example of cereal and pulse combination which means that it is good quality protein rich recipe. It is also power packed with energy and fibre which is required during pregnancy. Mixed Sprouts and Vegetable Pulao is balanced one-dish meal that provides you all the necessary nutrients or you can combine it with curd or raita to enhance protein and calcium. 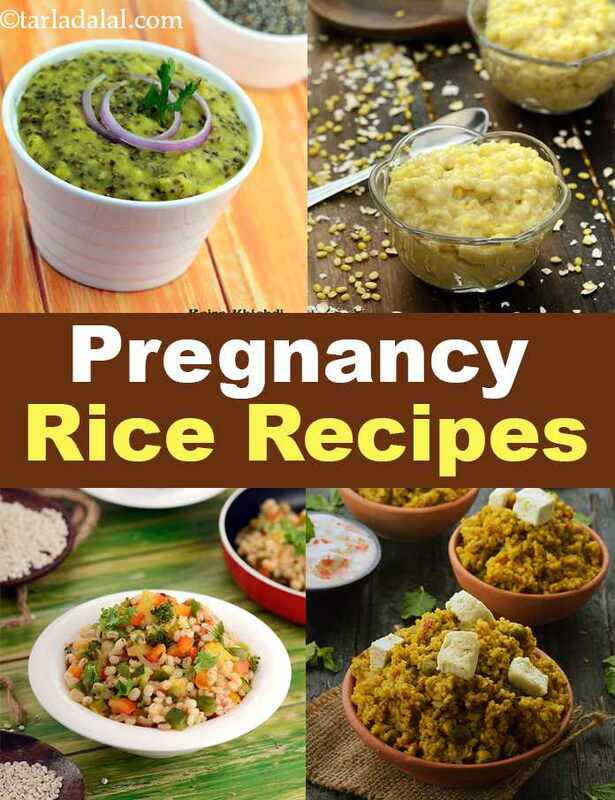 Enjoy all our rice, khichdi and pulao recipes for pregnancy. Explore more varieties in our pregnancy section everyday. An aromatic khichadi baked and served in a casserole.